This training will provide participants the regulatory background and guidelines through all critical areas of GMP compliance. This course helps attendees understand the latest requirements and also provides them templates and examples to develop inspection ready documentation. 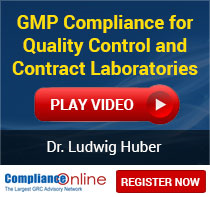 Learn about the regulatory background and GMP requirements for quality control and contract laboratories. Understand and be able to explain your company’s quality plan or laboratory compliance master plan. Understand the difference between GMP and non-GMP laboratories. Learn how to develop inspection ready documentation. Be able to train others in your organization on GMP requirements. Learn how to avoid and/or respond to the FDA inspectional observations and warning letters. Registration: Contact customercare(at)complianceonline(dot)com or call +1-888-717-2436 to get registration details of this seminar.